Jackpot.com is one of the better lottery sites that isn’t a lottery agent, though several missteps hold it back from greatness. It’s easy to dismiss Jackpot.com as yet another mediocre lottery site that’s destined for obscurity. After all, it’s relatively new to the scene and hasn’t really proven itself quite like industry stalwarts, such as theLotter. That said, the company definitely shows a lot of potential. It’s a simple, no-nonsense lottery site that offers a decent number of lottery games, accepts a ton of payment methods, and provides a secure experience. Some shortcomings hinder their otherwise promising service though. Some game types are lacking; bank payment is limited to only one bank; and despite the “no commissions” claims, they withhold a sizable percentage from the two highest prize categories of Powerball and Mega Millions. 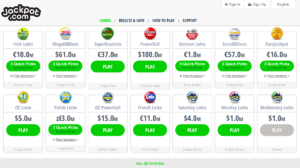 Still, if you are looking for a simple lottery site, Jackpot.com is well worth a look—especially considering they are constantly improving their service. Jackpot.com is a lottery betting site that provides players the opportunity to bet on the outcomes of the biggest American and European lotteries. When you place a bet with Jackpot.com, you won’t be participating in the official lottery, but the experience stays largely the same. You pick numbers the same way, and winners are determined by the same rules. As for winnings and payouts, Jackpot.com will match the amount of the official lottery’s – all the way up to the jackpot! Aside from that, Jackpot.com also features side games and scratch cards to allow for even more chances of winning. Players can place bets any of Jackpot.com’s supported lotteries. It’s easy enough for anyone to play. Much like any other lottery site, playing at Jackpot.com is pretty straightforward – though options are a bit limited here. Login to your free Jackpot.com account. Choose from their selection of lottery games – click on the “Play” button when you’ve chosen one. Pick your numbers. You can choose to do so manually or via the Quick Pick option. Choose between a single purchase, or a continuous subscription. That’s all there is to it! Take note that you can also manually choose how many draws you participate in. You can choose to participate in a single draw, multiple draws or you can take part in every draw via subscriptions. And, if you subscribe, you also have the benefit of changing your numbers or cancelling your subscription at any time. 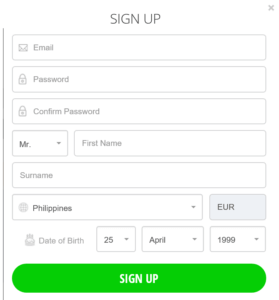 Signing up for a free Jackpot.com account is quick and hassle-free. You only have to provide your name, email address, date of birth, and country of residence to immediately start playing. To sign up, visit Jackpot.com through this link. Jackpot.com, launched in 2016, is an online lottery company licensed and regulated by the Malta Gaming Authority and the UK Gambling Commission. They are classified as a lotto betting site, which means that they don’t send out agents to purchase lottery tickets on your behalf. Buying an entry here means that you are simply betting on the outcome of games. Want to save on purchases? Jackpot.com offers weekly promotions! One of their promotions allows you to receive a surprise gift if you spend €5 or more on Sundays. You can also get a nearly 60% discount on Powerball, Mega Millions, Irish Lotto or EuroMillions subscriptions. Or, you can save up to 15% on 30 scratch cards! So, if you’re looking to save up, Jackpot.com’s regular promotions can definitely help you out! Jackpot.com offers a pretty decent collection of regular lottery games. They lack some game types though. Currently, there are over 20 lottery games on tap. These range from popular ones like Powerball, Euromilions, and Mega Millions, to less known lotteries like the Polish Lotto or Saturday Lotto. One thing that I don’t like about Jackpot.com though, is how limited their game types actually are. Some of the games Jackpot.com offers. Yes, 20 lotteries are nothing to scoff at, especially when there are websites that offer less than 10 games. That said, Jackpot.com only offers regular lottery games. You won’t find syndicates or millionaire raffles here. If regular lotteries are all you’re after, they definitely deliver. But, if you want to be able to play in group play games or raffles too, it’s best to look elsewhere. That said, they now offer other game types that should scratch your itch for some variety. Before, Jackpot.com lagged behind some of their competitors with regards to side games—but it seems the tables have turned. Jackpot.com now offers more than 20 different scratch cards for you to enjoy. Interestingly, these are the same ones that sites like WinTrillions and LottoKings once offered (until recently, that is). Depending on the scratch card and the number of games you want to play, prices range from €0.50 to €22.50. As for the prizes, don’t expect anything too substantial. You’ll still be better off winning at the lottery. For instance, the lowest amount you can win from their Cash Cuisine scratch card is a measly €0.50. Of course, winning the top prize is a different story. First prizes range from €1,000 to as high as €25,000. Still not as big as a second, third or even a fourth prize lottery win, but it’s not so bad. If scratch cards aren’t your thing, Jackpot.com has recently added other game types that might catch your fancy, such as Keno, Bingo, and a variety of virtual slots. Thankfully, prices here are generally much more affordable. No scams here. Jackpot.com is fully secure and provides a safe place for everyone to enjoy their favorite lotteries. Definitely! Jackpot.com is a legitimate company that provides a safe gaming experience for everyone. Prizes are guaranteed and regularly given out. If you’d like to read more about actual people winning with Jackpot.com, you can read further down for more information. As far as security goes, Jackpot.com doesn’t differ much from other sites. They offer Thawte SSL encryption, though they don’t really advertise it. One scan using Norton SafeWeb, however, confirms this fact – not to mention how Jackpot.com is pretty safe overall. Unlike other lottery sites though, they don’t make use of Return Path to curb spam mail. Is Jackpot.com a real or fake company? Jackpot.com is a real company that is licensed and/or regulated by 3 different entities. They are both licensed and regulated by the Malta Gaming Authority and the UK Gambling Commission, for starters. Meanwhile, they are licensed as a remote bookmaker by the Irish National Excise License Office. So, if you have doubts about their legitimacy, these should ease your fears. Jackpot.com is owned by Lottomatrix Operations Limited, a company registered with the registrar of companies in Malta. How does Jackpot.com make money? Like other lottery betting sites, Jackpot.com makes money primarily through the sale of lottery bets. This leaves them with enough profit to pay out smaller wins themselves, while their insurance provider will cover larger amounts like jackpots. Yes, Jackpot.com is completely legal. And as long as you’re from a country that permits online lottery betting, you are free to use their service as well. Does Lottery Critic trust Jackpot.com? Absolutely. 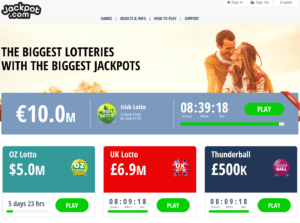 I’ve been following Jackpot.com’s growth since it first launched and it’s definitely earned our trust here at Lottery Critic. It’s easy to find out if you’ve won, and it’s even easier to receive your winnings – for the most part, anyway. You can either get a notification email of your big win, or you can check the results page or your Jackpot.com account. Unlike more popular lottery sites, though, there is no SMS alert feature here, so you better keep a close watch on your email or the Jackpot.com website when you are on the go. As for receiving your winnings, Jackpot.com deposits all prizes directly to your account. That said, take note that for jackpots, you will have to get in touch with their Customer Support team first before you can receive your prize. This is because the payment method differs for larger wins compared to smaller prizes. It’s not a big deal, to be honest. What is a big deal, however, is that Jackpot.com’s Terms and Conditions state that, for the higher prize categories of Powerball and Mega Millions, 39.6% of your winnings will be withheld by the company. This is contrary to their claims of not taking any commissions from winnings. To be fair, they don’t do this for other games – just the ones I mentioned. Still, 39.6% is pretty huge, considering you still need to abide by your local tax laws. One thing I liked about Jackpot.com is the sheer number of payment methods they accept. Currently, they accept a total of 32 payment methods – ranging from popular credit cards to a wide array of alternative payment methods. Something to take note of: Jackpot.com recently added the option to pay using bank transfers. Unfortunately, it seems this feature is still in its infancy. It seems that you can only deposit if you have an account with Barclays Bank. It’s still better than nothing though. As for the accepted withdrawal methods, Jackpot.com doesn’t really specify beyond Visa, MasterCard, Skrill and NETeller. They do mention that there are other “independent payment methods” available, but you would have to actually reach the point where you can withdraw some money to know what those are. Of course, you can ask their customer support as well. Has anyone won on Jackpot.com? €248,000: 40-year old Valentin Z., a welder from Enfield, London won the March 21, 2017 EuroMillions draw by matching six of the seven numbers. The winning numbers were 1, 20, 23, 44, 47, 4, and 11. €97,000: Maria Dolores, a mother from Malta, won the EuroMillions when her subscription matched 5 numbers out of the winning seven. She had had the subscription for about 6 months, which landed her 2 smaller wins before finally hitting it big. Jackpot.com supports an iOS mobile app that can be installed on your iPhone or iPad. It’s not the best lottery gaming app out there, though, as it isn’t regularly updated. Some users even report that they can’t get the app to launch at all. For Android users, no Jackpot.com app is available. We recommend all Jackpot.com players looking to play on-the-go to navigate to their official website. It’s optimized for any device and works smoothly in our experience. Jackpot.com can be reached via email, phone, live chat, Whatsapp, Facebook messenger, and their very active social media accounts. Both phone and live chat channels aren’t available 24/7 though – you can contact them between 6:00GMT and 22:00GMT. The Jackpot.com website’s FAQs are packed with a ton of information about their service. These should be more than enough to guide you through the basics. While not as comprehensive as other sites, they do a good job of introducing players to each lottery game. Each page contains bite-sized information about each game – from how to play to the odds of winning, and more. Their FAQ section, meanwhile, also provides snippets of information about scams. Ultimately, Jackpot.com’s attempt at educating players is good – though more depth is definitely welcome. Jackpot.com’s website is one of the simplest ones I’ve encountered. It looks and feels just like any other lottery site; the latest lottery jackpots are displayed front and center, while menus let you access more games and the results page. However, because they only offer regular lottery games, the website feels a lot more lighter and streamlined as a result. It also helps that the design is minimalistic to the point that it doesn’t really get in your way. There are no annoying ads, either – which is always a plus. Overall, you’re getting a simple and very easy to use lottery site here. One of the more interesting features that Jackpot.com offers is player protection controls. With this, players can manually set a maximum daily spend limit at any time. You can either set daily, weekly or monthly limits for deposits or wagers – your choice. If you want to further nip the possibility of gambling addiction in the bud, you can also temporarily suspend your account for a predetermined period. Finally, Jackpot.com also verifies each player’s age on sign-up to keep minors at bay. Final Thoughts – Should You Use Jackpot.com? It’s worth a look – but you have to make peace with Jackpot.com’s shortcomings. The shortcomings make it hard for me to see them among my top 3 list. But, as I’ve mentioned before, Jackpot.com is still a pretty new lottery site so expect a lot of room for improvement. Only a year in though, they’ve managed to catch up with a lot of established online lotteries. For instance, they started out offering only a mere 4 lottery games, but now they have 22. They also added a variety of new game types, accept a wide array of payment methods, and offer regular promotions. This continued evolution, not to mention the simple, secured lottery experience they offer, makes them a company worth keeping an eye on. My account is debited by EUR 9.99 per month. I would like to know what I am playing and the numbers I play.